In 1832, Professor Joseph Henry gave the first in a series of lectures on chemistry, and introduced the topic by discussing the role of basic research in technological advancement. Henry remarked that Benjamin Franklin's intellectual pursuits "led him to the most astonishing results ever recorded in the history of discoveries or inventions, to the art of defending human habitations from the lightnings of the heavens. "1 Henry was on his way to becoming America's preeminent scientist based on his own electrical research, which included the investigation of lightning. 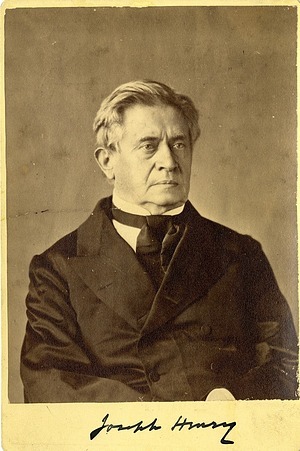 Joseph Henry was a professor of physics at Princeton University for nearly fifteen years before becoming the Smithsonian's first Secretary in 1846. Although Henry commented in 1841 that "Princeton of late years has been remarkably exempt from lightning," he finally had the opportunity in July of that year to document the effects of a lengthy and severe thunderstorm during which at least three houses and one barn were struck by lightning. The details he recorded 2 illustrate three effects that Henry would later discuss in an extended essay on the topic: the "sudden and violent repulsive energy" lightning produces in the air and objects through which it passes; the induction of static charges in areas underneath storm clouds prior to lightning strikes, causing tall metallic objects to attract lightning; and the process of lateral discharge, allowing sparks to be drawn from lightning rods even when they are well-grounded. Henry's notes from July 1841 include the observations of people struck by lightning. The resident of a house on Princeton's Main Street "felt a sensation on her right ear . . . as if it had been touched with a live coal of fire. She also felt a 'rushing sensation' down her left side and perceived a brilliant discharge of light at her foot." Henry concluded that lightning had passed through a gutter and a pipe connecting it to the ground, both of which were filled with water. At another house he visited that day, Henry observed that lightning had passed through a chimney into the room below, causing a couple and their son to feel shocks in their legs and filling the house with a "strong odour of sulphure." A year later, Henry visited another house struck by lightning described by neighbors as "a ball as large as a water pail," and in 1843, lightning successfully charged a set of needles Henry had connected to the roof of his house with wire. "This apparatus magnetizes a needle in my study by every flash of lightning which takes place within a circuit of 20 miles in diameter around Princeton," Henry later wrote. While at Princeton, Joseph Henry became known as a leading authority on scientific matters, and was consulted on a range of topics by people familiar with his work. Henry wrote in response to an 1846 query about lightning, "I am often called on for information of a scientific nature and when the request does not make too great a demand on my time in the way of research, I feel it my duty to give any information I may possess." He went on to outline the basic principles of electricity and lightning and to describe how to build a lightning rod. As he had written three years earlier to a Brooklyn, New York, pastor on how to protect his church, Henry believed a lightning rod designed in the manner recommended by the French Académie des sciences in 1823, with a single point at its tip, remained the most effective means of protection from lightning. In 1845, Henry received an inquiry from University of North Carolina tutor Charles Phillips on how to protect a new courthouse being erected in Chapel Hill. A graduate of the Princeton Theological Seminary, Phillips had been "fortunate enough, while at Princeton, to hear [Henry] lecture on the application of the laws of Electricity to the defence of buildings," and requested Henry to provide more detailed information. Henry made a presentation to the American Philosophical Society (APS) in 1845 on how to protect houses with metal roofs from lightning after receiving a query on the subject from Princeton trustee James Lenox. "A house of this kind is evidently more liable to be struck . . . ," he wrote to Lenox, "but fortunately it is not difficult to show that it admits of a more perfect protection." Henry recommended simply grounding the roof with copper gutters, making a lightning rod unnecessary. The following year, Henry presented another report to the APS on protecting telegraph poles from lightning. In 1843, he reported on protecting arsenals containing explosive ammunition from lightning strikes. "I have made a series of expermts [sic]," Henry wrote to British scientist William Brooke O'Shaughnessy, "which . . . will tend to support your plan of protecting powder houses by a number of rods at some distance from the building." The danger of lightning to ships at sea was also a concern at a time when ships served as the only mode of overseas travel and trade. In 1837, Joseph Henry wrote to his wife of the violent thunderstorm he experienced at sea on his way home from Europe. Although an effective lightning rod for ships had been invented, Henry noted "there is . . . a strange antipathy to its use among sailors. [They] imagine the vessel is in more danger when it is employed, forgetting that the tall masts serve as attractors without giving protection." A decade later, Henry was asked to advise an APS committee charged with investigating the destruction of a cargo ship by lightning. Although the ship was outfitted with a conductor, the captain had been too fearful to use it. 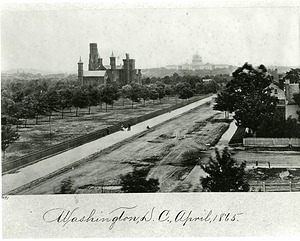 Within a year of his arrival in Washington, DC, to assume his post at the Smithsonian, Henry was called upon to advise on protecting the US Capitol Building from lightning. A gaslight entrepreneur had proposed the outside of the building be lit by attaching a massive lantern to an eighty-foot mast extending from the dome's center. While Henry was clear that such a mechanism would surely attract lightning, he also believed strikes could be prevented by properly grounding the lantern. However, he concluded that "no protection against the effects of lightning can be so perfect as to render the building, as safe, as one, in which there is no increased tendency whatever of the electricity to fall." Henry opined that he did not "think the mast [would] long be allowed to disfigure the dome of this imposing edifice," and wondered whether members of Congress would be made to feel more vulnerable by its existence. With modifications recommended by Henry, the mast was erected. The following summer, however, Henry was asked to inspect the mast and discovered that lightning had struck it several times. The mast was then removed. As Smithsonian Secretary, Joseph Henry was also asked by US Mint director and University of Pennsylvania trustee Robert M. Patterson to advise on protecting Philadelphia's Independence Hall from lightning. "The destruction of Independence Hall would be an evil felt by the whole American nation, and forever to be regretted," Patterson concluded, after outlining three possible adjustments to the building's existing lightning rod. While there is no direct evidence of Henry having made recommendations, the building's lightning rod was adjusted shortly after he was consulted. Henry remained interested in the effects of lightning throughout his career at the Smithsonian. In 1855, after reading of a fatal lightning strike in Wisconsin that had "melted the point" of a lightning rod and passed through someone's home, he asked the surveyor and naturalist Increase A. Lapham to investigate the incident. In 1859, he published "Atmospheric Electricity," the fifth installment in his series "Meteorology in Its Connection with Agriculture" for the Patent Office's annual reports. In conjunction with the Smithsonian's meteorological project, Henry distributed instructions on observing thunderstorms and on constructing lightning rods. In 1878, the year of his death, Henry had a letter3 published on the best way to observe thunderstorms. Lightning was among a myriad of scientific topics on which Joseph Henry was considered an expert during his lifetime. Henry's research in this area and his efforts to protect buildings from lightning illustrate an argument he made throughout his life: that the scientific knowledge gained from basic research was essential for solving real-world problems. Marc Rothenberg, "Joseph Henry: Science Adviser," Smithsonian Institution Archives.